If I'm going to be precise, my year of circles is not up until Monday, but I know I'm busy this weekend, and want to get my post done in time to link up with Audrey, so I am going, uncharacteristically, to complete ahead of time. In fact I have already finished my last lot of circles. Of course the eagle-eyed among you will spot instantly that this is nothing like 366 circles, so to recap: I started last November 8th, making denim squares with blue circles appliqued, but somewhere along the line (132 days in, to be precise) I got a bit bored so took a break and turned them into this. So these two tops amount to 299 circles in all - not a year's worth exactly but not bad, I think. However playing around with circle-y ideas also led directly to this one. I can't really count it as part of Quilty 365, as I did way more than a circle a day when piecing it, but in my head it kind of belongs with the other two. To sum up then, I don't think any of what I have done is exactly in the spirit of the original challenge as laid out by Audrey, but it has been a very interesting exercise for me and I'm glad I participated. Focusing on one simple shape has sparked off loads of ideas, so I may not be done with circles yet, but repeating the same basic unit every day for a year is definitely not for me: I started off with good intentions but have moved further and further away from this as the year has gone out and have ended up making the last circles in big batches. I still like the idea of something more diary-like (like Cathy's Marginalia) and might feel drawn to try that at some point, but I'd have to find a way to keep myself going! In the meantime I have to figure out how I turn my little shirt circles into a quilt - I'm not making more circles now so that will be my next task after I finish piecing my red, white and blue. Quite a few people are still circling, or like me are coming to an end. Audrey's link up is a great way to see loads of different interpretations of this idea. which are both at Busy Hands Quilts today. Wow!! You got so inspired! 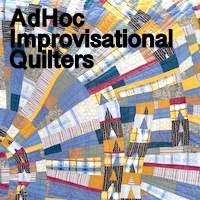 Those are great quilts! I like those circles. I can see where it would become a chore to do one every day. I'd be like you, do a bunch at a time. Hey, it works. Your quilts turned out lovely! 3 very different looking projects at the end and they look funfilled. Something about a circle seems like a happy shape to me. Congrats on getting there in the end! All three batches of circles are gorgous! The denim quilt is so fun with the other shapes added in and that last quilt is so fun. I can see where doing one a day for a whole year might get old, but I can also see you had some great inspiration going on. I will always associate you with circles ! How can you stop circling ? I adore all three of your iterations of the circle project! Lovely, lovely, lovely! Three projects for the price of one as they say, and these are three wonderfully unique designs. I only made about half a year of these circles but like you, they sparked several ideas. Unfortunately, all mine are still ideas. What lovely quilts you've made. I can't wait to see what else you design. And I think this is completely within Audrey's challenge. What a great end to your circle projects! All three are just a delight but being a colour freak, the more the merrier, I love the last one best, a real beauty. I agree with Maureen, the last one is a 'beauty.' A lot of creativity can happen sticking to a theme. I think all three of your projects are beautiful. I do like the varied color backgrounds that form larger blocks in that first one. I think you already know I adore the other two. I'm just catching up to this post and I'm really glad you included pictures of all three circle projects. They coordinate so beautifully. And it's interesting to see how your imagination turned one block into such different quilts. Like everyone else, I enjoy seeing your creative process at work. All three quilts are so different from each other! I like them all but the last one, the red one is my favorite. So pretty! I like how you went through three interpretations on the same theme. I really love those stripey circles. Oh my goodness! I have been away too long. All of your circles are so beautiful. I really should dig out my project.